Here's a lower body leg workout you can take a shot at today, and it won't send you running...for cover....no pun intended! Sometimes, a leg workout routine can seem intimidating or overwhelming, especially if you add in a LOOONGG cardio session after you strength train. SO...if you'd like to try out a more simple approach, check this out! I LOVE doing legs, especially body weight leg routines. And this one is simple yet AWESOME for helping you get your legs (and your abs) in shape! Compliments of the "28 Day Fit & Toned Bikini Body Challenge". This is "Workout #1" of the 5 Workouts Per Week plan. I did this workout at the gym this morning, and not only does it fire up your fat burning potential by incorporating High Intensity Interval Training, but it also helps to strengthen, trim & tone those legs (& abs) while you're at it! Tip: Pin this to one of your Pinterest boards so that you can take it with you to the gym! 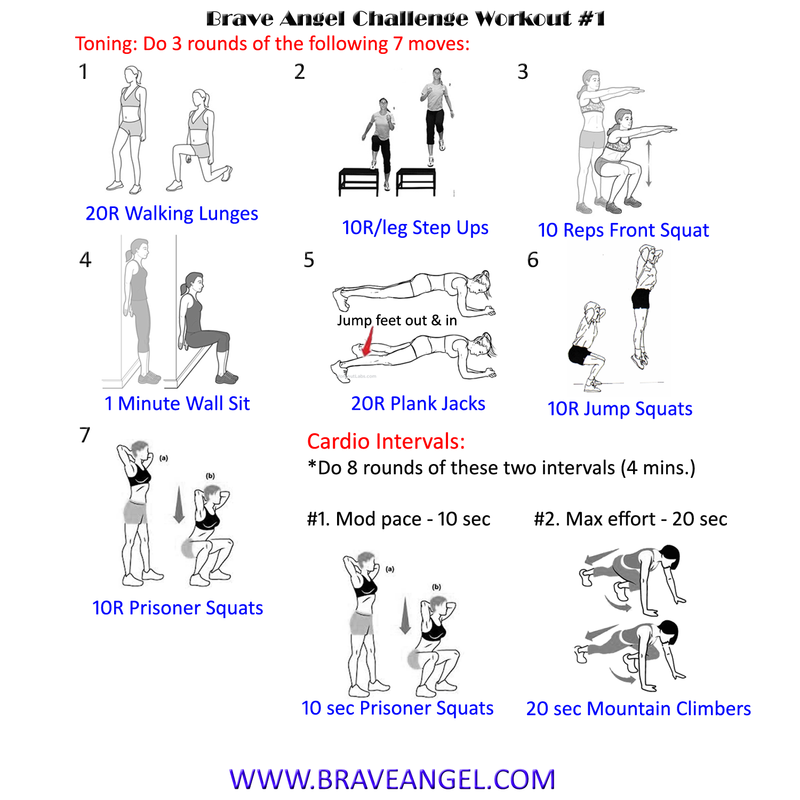 To get the details on the exact instructions & modifications for all skill levels for this Workout and the rest of the "28 Day Fit & Toned Bikini Body Challenge", visit our Brave Angel Shop or CLICK HERE! Also, check out the "28 Day Fit & Toned Bikini Body Diet"...because nutrition is 80% of the equation when it comes to achieving your health, fitness & weight loss goals! Over the next 48 hours, the Fit & Toned Bikini Body Diet is included for FREE with your "28 Day Fit & Toned Bikini Body Challenge"!